Joe Dyson has began recording his Debut Album, “Pious Walk!” If you want to catch an inside look into the process with live footage, pictures, and new sounds to come, scroll below, and stay stunned! Oscar Rossignoli, Stephen Lands, Joe Dyson, Stephen Gladney, Jasen Weaver. Joe Dyson, with the owner and engineer of Esplanade Studios, Misha Kachkachishvili. Here's a snippet from my debut Jazz Fest performance. Thank you to everyone that came out and supported me on my first performance at the New Orleans Jazz and Heritage festival! Also, thank you to WWOZ 90.7 fm for live broadcasting the show and to all that tuned in! Read my new article on "My Spilt Milk" blog site. You'll find out everything that I'm up to these days, as well as my inner thoughts about life. Just click the picture! New Orleans, SAVE THE DATE! My band will perform May 6th at the Historic New Orleans Jazz & Heritage Festival! If you're unable to be there, tune into WWOZ.ORG. We will live stream the performance just for you! Spread the Word!!! Next month, for two shows, Joe Dyson will lead his own band. Be sure to catch him in New Orleans, Live! On November 2nd, come and see the Joe live at The Prime Example, located at 1909 Broad St. New Orleans, LA 70119. The night will be filled with new original compositions and some arrangements of the great New Orleans Drum Composers. The band will feature some of New Orleans finest talent including Steve Lands, Stephen Gladney, Oscar Rossignoli, and Jasen Weaver. Sets begin at 7PM & 9PM. 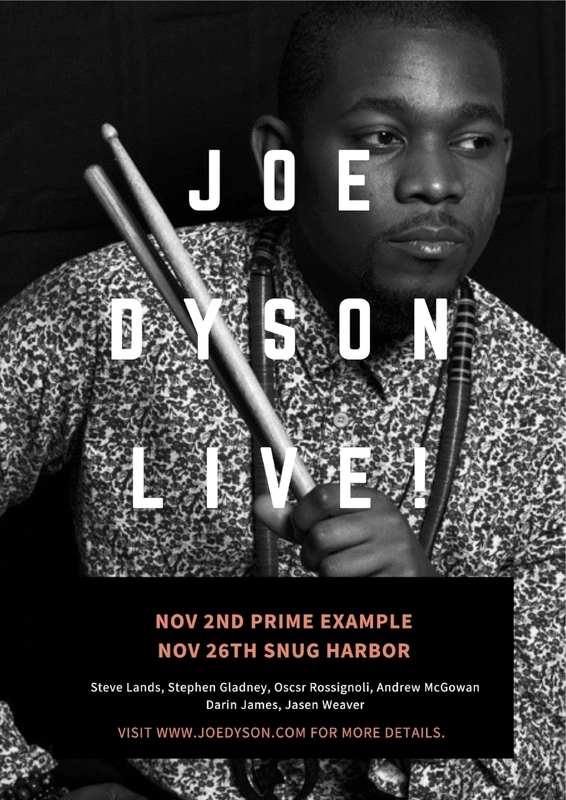 On November 26th, Joe Dyson will perform at New Orleans' premier Jazz Club Snug Harbor Jazz Bistro. The club is located at 626 Frenchman St. New Olreans LA 70116. The night will be filled with new original compositions and some arrangements of the great New Orleans Drum Composers. The band will feature some of New Orleans finest talent including Steve Lands, Stephen Gladney, Andrew McGowan, and Jasen Weaver. Sets begin at 8PM & 10PM.